Under Cabinet Monitor and Keyboard Workstation | ICWUSA.com Inc.
Make use of wasted space with ICW’s Under Cabinet Monitor and Keyboard Workstation. 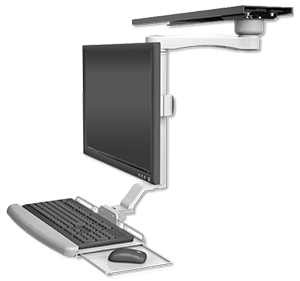 Mounts beneath overhead cabinets, pulls out when needed and folds up and out of the way when not in use. A unique feature of this arm is its ability to slide horizontally on a 28” (71.12 cm) track which increases the range of motion. The model shown features a flat keyboard tray with slide-out mouse trays on both sides. Machined out of aircraft quality aluminum, this unit has an attractive, durable finish. Hand assembly ensures that a quality product is shipped to you.